Map of California numbering plan areas (blue) and border states. Area code 951 is shown in red. Area code 951 is a California telephone area code that was split from area code 909 on July 17, 2004. It covers western Riverside County, including the cities and communities of Beaumont, Corona, Canyon Lake, Riverside, Temescal Canyon, Woodcrest, Arlington, Moreno Valley, Perris, Menifee, Lake Elsinore, Wildomar, Murrieta, Temecula, San Jacinto, Hemet, Lakeview, Nuevo, Norco, Banning, Eastvale, Jurupa Valley, and Idyllwild. 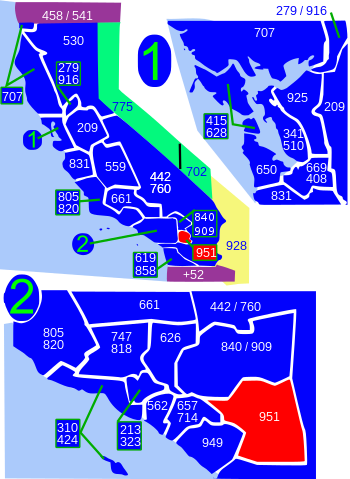 Until November 14, 1992, the area covered by 951 was part of area code 714. Area code 951 is currently the last new area code in California to have been split from another one. Every code introduced in the state since have been overlays. This page was last edited on 24 November 2018, at 18:21 (UTC).